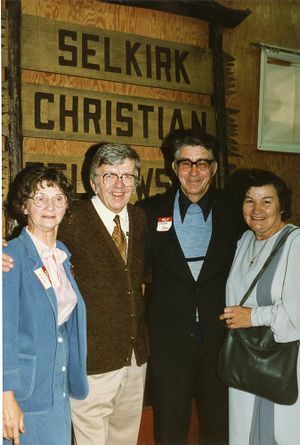 Helen and Jake Wiebe, 2nd pastor (left), with Hannes and Winnie Bell, founding members, 1986. Photo: Mennonite Heritage Archives (493-166). Elim Christian Fellowship (later called Selkirk Christian Fellowship) building on Main Street, ca. 1970. Photo: Mennonite Heritage Archives (493-017). 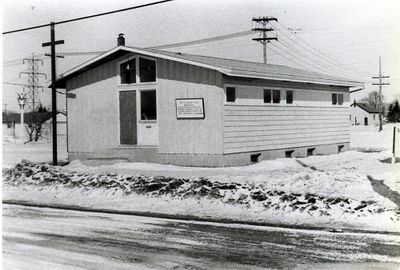 The Selkirk Christian Fellowship in Selkirk, Manitoba began in 1966 when a group of families who had earlier had contact with the Mennonite Pioneer Mission (MPM), moved to the Town of Selkirk from their communities in Bissett, Matheson Island, Loon Straits and Pine Dock and met for fellowship. Orville Andres, a former MPM worker at Loon Straits, who was attending Canadian Mennonite Bible College, in 1966, helped provide regular services. In 1967 the Conference of Mennonites in Canada’s newly established Board of Missions confirmed Jake and Trudie Unrau’s calling and placement in Selkirk to help establish a church. At first the group met in the Odd Fellow’s Hall on Cladeboyde Avenue. Then the CMC Board of Missions helped them purchase the vacant Church of the Nazarene at 173 Main Street, where they continued to meet until they closed in 1993. The language of worship was English. The church was known as Elim Christian Fellowship until 1984 when it formally incorporated and changed the name to Selkirk Christan Fellowship. A 20th anniversary celebration and homecoming was held in 1986. The church related to the Conference of Mennonites in Canada through its Native Ministries program, but never joined as a congregation. The congregation held its last service on 28 February 1993. It had experienced a decline in attendance and interest because of a desire for a faith expression more closely identified with traditional Native roots. After the congregation closed, a community ministry was continued by Terry and Cara Widrick. Canadian Mennonite (20 September 1966): 3. Mennonite Reporter (1 April 1985): 11; (22 March 1993): B1; (18 April 1994): B3. Unrau, Jake with Johann D. Funk. Living in the Way: the Pilgrimage of Jake and Trudie Unrau. Winnipeg, Manitoba: CMBC Publications, 1996: 86-92. See Selkirk Christian Fellowship fonds at the Mennonite Heritage Archives in Winnipeg. Denominational Affiliations: Related to the Conference of Mennonites in Canada through its Native Ministries program, but never joined as a congregation. Redekopp, Alf. "Selkirk Christian Fellowship Inc. (Selkirk, Manitoba, Canada)." Global Anabaptist Mennonite Encyclopedia Online. 14 June 2018. Web. 21 Apr 2019. http://gameo.org/index.php?title=Selkirk_Christian_Fellowship_Inc._(Selkirk,_Manitoba,_Canada)&oldid=160892. Redekopp, Alf. (14 June 2018). Selkirk Christian Fellowship Inc. (Selkirk, Manitoba, Canada). Global Anabaptist Mennonite Encyclopedia Online. Retrieved 21 April 2019, from http://gameo.org/index.php?title=Selkirk_Christian_Fellowship_Inc._(Selkirk,_Manitoba,_Canada)&oldid=160892. This page was last modified on 14 June 2018, at 19:48.